Professor Stephen William Hawking passed away on March 14, 2018 at the age of 76. Professor Hawking was a theoretical physicist, cosmologist, author and Director of Research at the Centre for Theoretical Cosmology within the University of Cambridge. Not only did he revolutionize theories of quantum mechanics and relativity, but he achieved an unusual level of fame because of his best-selling book A Brief History of Time and his frequent appearances and references in pop culture. He did it all while restricted to a wheelchair due to ALS that left him almost completely paralyzed. 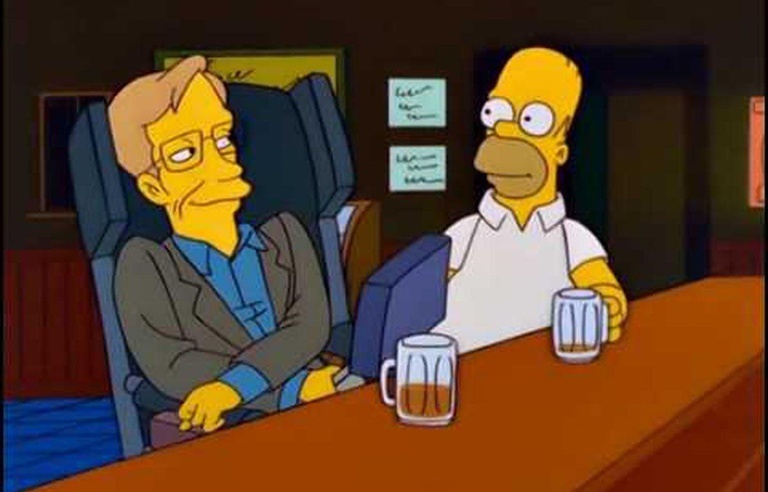 We here at Geek Twins would like to honor his memory by going over the greatest TV moments of Stephen Hawking. We won't be going to movies or TV shows that mentioned or paid homage to him, but those where he appeared or voiced in person in a fictional context. In a sketch for Red Nose Day 2015, with David Walliams and Catherine Tate. Williams played Lou, the patient friend and caregiver from the TV show Little Britain. Instead of Lou's usual wheelchair-bound friend Andy, Stephen Hawking appeared as himself. Lou insisted on treating Hawking like a child until Hawking grew fed up and transformed into a laser-firing Hawking-Bot. 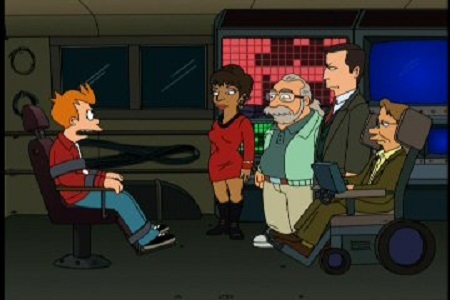 Hawking made a total of three appearances on the animated show Futurama, but his first made him an icon on the show. In 2000's "Anthology of Interest I," Fry avoided being frozen in time and caused a rift in the space-time continuum. To stop the destruction of the universe, Hawking appeared as a member of the Vice Presidential Action Rangers that included Al Gore, Nichelle Nichols, Gary Gygax, and their summer intern chess-playing computer Deep Blue. On The Big Bang Theory, Stephen Hawking played a huge role in the lives of the loveable geeks, having been mentioned in the pilot and beyond. 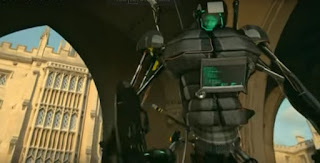 Yet he never actually appeared in person until 2012's "The Hawking Excitation" when Howard used his work with Sheldon's idol Professor Hawking to take advantage of Sheldon. 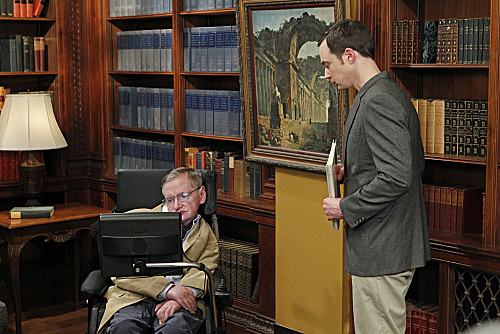 Howard forced Sheldon to perform a series of grueling and humiliating tasks in order to meet Hawking. In total, Stephen Hawking made four appearances on The Simpsons, so many that Groening presented him with a toy Simpsonized action figure of Hawking. 1999's "They Saved Lisa's Brain" marked his first appearance when the Springfield chapter of Mensa took over the town. Hawking came to Springfield to stop Lisa, and demonstrated a retractable helicopter and a spring-loaded boxing glove on his wheelchair. Hawking was a huge fan of the Simpsons and treasured his appearances on the show. Of course, as someone who loved space, Hawking was a fan of Star Trek. Through Leonard Nimoy (who did the voiceover for A Brief History of Time), Hawking made his dream of appearing on Trek a reality. 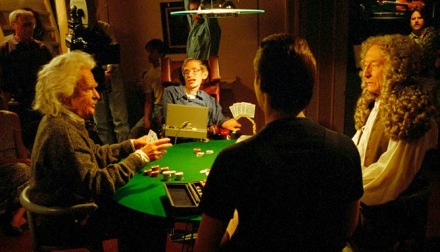 In the 1993 season finale of Star Trek: The Next Generation "Descent, Part 1," Data brought Hawking, Sir Isaac Newton, and Albert Einstein onto the holodeck to play a game of poker. Hawking portrayed his own hologram for this episode, making him the only guest star in any Star Trek series to play himself. What was your favorite Stephen Hawking role? Let us know in the comments!